Close to Lizard Island, Lake Superior is covered with a low thick fog. A thick fog covers Lake Superior. A few tree tops peak over the top of the fog. Evergreens sit in the foreground overlooking the fog. The view of the fog over the lake seems endless. Lake Superior shrouded by fog near Lizard Island, Lake Superior, Lake Superior Provincial Park, Ontario, Canada. 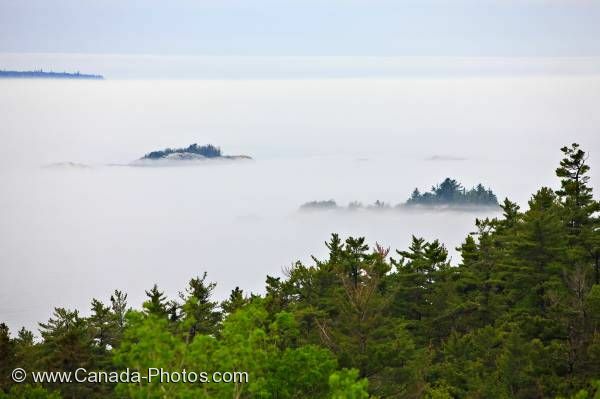 A thick misty fog hangs low on Lake Superior near Lizard Island, Ontario, Canada.